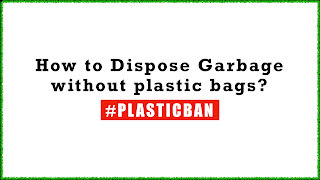 Home / Blog / #PlasticBan in Maharashtra : How to Dispose Garbage ? Maharashtra plastic ban: As per the government notification, violators will be fined Rs 5,000 and Rs 10,000 for the first and second-time offense. A third-time offender will have to shell out Rs 25,000 and may also face imprisonment for a period of three months. Maharashtra government is taking steps to protect environment. Plastic ban in Maharashtra will be enforced from Saturday 23 June 2018. BMC is organising event in Worli , Mumbai to educate citizens about plastic ban from 22 June 2018 - 24 June 2018. Expo will be held at NSCI(The National Sports Club of India ), Worli. What are the types of plastic are not allowed ? What are the types of plastic are exempted or allowed ? There are bio-degradable bags available on Amazon to order. Click on the following link to order it via Amazon. If you want to learn about disposing garbage checkout tips by film actress Diya Mirza.